We went through whole oxford dictionary but could not find even a single word which can describe the level of great courage and sacrifice shown by army men. 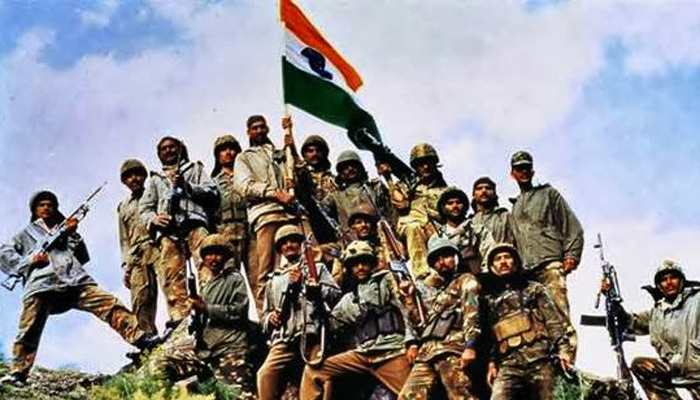 Kargil Day or Kargil Vijay Diwas is observed to mark the end of the Kargil War. The war that lasted about two months was fought mainly in the Kargil sector of Jammu and Kashmir between India and Pakistan. Both sides lost many soldiers and the war came to an end when on July 26, 1999 India fought and took command of the outposts that had been lost to Pakistani intruders. Kargil Vijay Diwas is observed not just in the Kargil-Dras sector but also in New Delhi where the Prime Minister of India pays homage to the war heroes at Amar Jawan Jyoti at India Gate. People danced and celebrated the day India witnessed victory over Pakistan. This article is incomplete until we discuss about unsung heroes of Kargil war who showed immense courage and bravery. 1)Capt. Saurabh Kalia- Captured, tortured, justice lacking – Capt. Saurabh Kalia’s fate is one of the most tragic episodes in the story of Kargil war. On may 15, 1999 the Captain and his men we engaged in continual firing with the Pakistan Army across the LoC. However, the Pakistani rangers surrounded them once they ran out of ammunition. They were taken as prisoners and for 22 days were subjected to third degree torture. Their heavily mutilated bodies were sent back to India on June 9, 1999. To this day, justice has not been granted in the case. 2)Captain Vikram Bhatra (Sher Shah)- Brave soul in a uniform - Hailing from Himachal Pradesh, Vikram Bhatra earned a place in the Indian Military Academy, Dehradun in 1996. He was first commissioned as a Lieutenant in the Jammu and Kashmir Rifles at Sopore but when tension between India and Pakistan evolved in Kargil, he was posted there. It was the daring capture of the crucial peak pint 5140 during the war that brought Bhatta into the public attention. As the Captain and his Delta Company neared the peak, the enemy started firing from machine guns. However, under the Captain’s command, the troop managed to topple the enemy’s post. Captain Bhatta sustained severe injuries during the attack. The nation honoured him with the Param Vir Chakra. Hailing from Uttar Pradesh, Yogendra Singh Yadav was instrumental in capturing three bunkers on Tiger Hill. It was Yadav who took on the task of fixing the rope for soldiers to reach the top of the cliff, situated at a height of 16,500 feet. Even though he was repeatedly fired upon by machine guns and sustained wounds, he kept on and arrived at the top to kill four Pakistani soldiers and neutralize fire. He was awarded the Param Vir Chakra for his bravery. 4)Captain Vijyant Thapar- Young, valiant, unforgettable - The 22 year old Captain Vijant Thapar lost his life while leading an attack of his infantry regiment, 2 Rajputana Rifles on 29 June, 1999. He was posthumously awarded the Vir Chakra by the President of India. Samudra mein teekhi chattan hu main, Baarish main aaya sehlaab hu main. Suraj ke prakash samaksh, Angaaro mei jalti aaag hu mei. Parvat ki tarah khada hu mei, Kankar ki tarah chubha hu mei. Bargadd ki bhaanti tana hu mei, Ptti ki smaan gira hu mei. Khuda nhi ,hawa nhi, Hu mei bhi ikk insaan hu mei !! !